iPhone, the popular iOS phone comes with many Twitter apps. These ipod touch apps come almost exactly the same in features and functions, but there is one app I consider the best Twitter app for iPhone. I am talking about Tweetbot. Does the name sound boring and generic to you? Read on and discover what this Tweet app can do for you, and your iOS phone. I believe that simplicity and functionality should come first, and that’s what Tweetbot is all about. Though its features are not complicated like how you think an app should be, all features are perfectly conceptualized that they meet the tweeting needs of the iPhone users/owners. Tweetbot brings the pleasure of managing your timeline, retweets, mentions, direct messages, lists, and favourites. Sounds interesting enough? The beauty of the app does not stop there. It will also allow you to create multiple accounts which is great if there are other persons using your iPhone aside from you. You can also search and find tweets while in the app, shorten URL through various services, and easily upload videos and photos. This best Twitter app for iPhone also brings additional features like the access to edit your profile, interface for time-saving, capability to translate your posts or tweets, access to Boxcar that allows you to push notifications, and the addition of Read It Later and Instapaper. READ A Polygraph on Your iPhone! I don’t consider Tweetbot a magical Twitter app, but I will say it does great for its purpose. It has simple features that will leverage your Twitter needs. The app brings all the convenience, accessibility, and functionality that you could ask from an app. 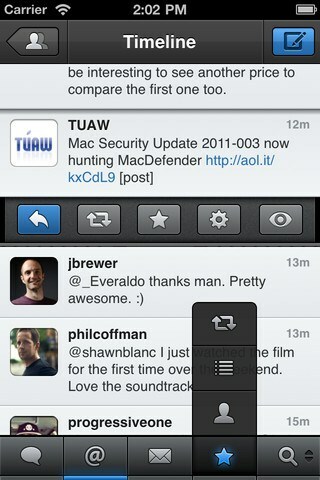 Just a tap on the screen of your iPhone will give you portal to the helpful features of Tweetbot. You can refresh your posts in an instant by pulling on the initiate refresh option. The interface is flawlessly incorporated that you will love every minute you will spend with the app. Though I consider Tweetbot as the best Twitter app for iPhone, there are things that I consider flaws. That’s actually excusable since nothing is perfect, but I will say this anyway. Aside from the fact that the Tweetbot app costs $2.99, there are times that it’s not that responsive. One time I tapped on the Twitter handle in an @ reply, but it did not immediately load the profile of the other user. This is not a big deal after all. Aside from this mark down, all other features work fine with me. Download TweetBot from iTunes Here. Why Check Out the Your iPod Touch Manual?